And it’s relatively easy to look at this and consider it to be common sense, setting aside the fact the only reason used copies are even available is someone buying it new. Let me throw some perspective on this. I’ve been working on getting physical copies for the songs I had in my iTunes collection — I’ve detailed why in another article. 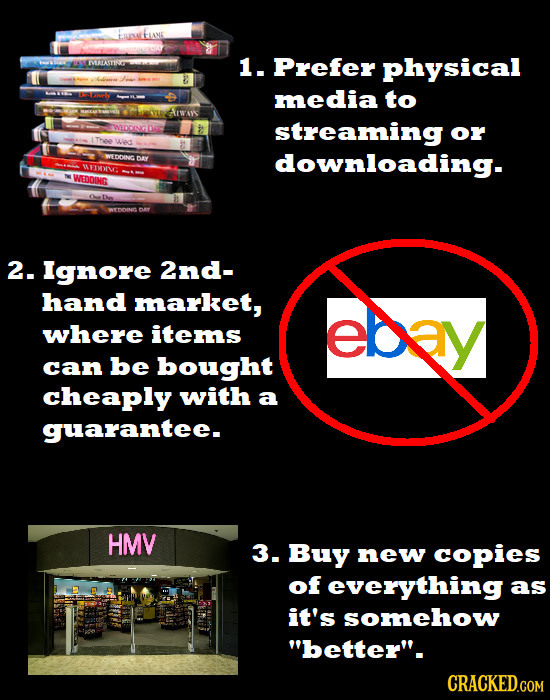 So since this means buying a lot of CDs, so I’ve been keeping an eye out for saving money where I can, buying used on Amazon and at my local Half Price Books where possible. Now up front the best reason to buy new is to support the talent behind what you’re buying. This is especially important for lesser-known artists and artists in a niche genre. Buying used doesn’t provide this support since you’re merely taking on a copy someone else paid for originally. That being said, buying new may, at times, be the better option. For one, it might be the only option, depending on what you’re looking for and when. But when buying used is an option, you need to do a cost comparison to ensure you’re getting the better value. Let me give you an example. Currently in my Amazon.com shopping cart, I have Every Open Eye by CHVRCHES, specifically the enhanced edition which has several other tracks to it. I’ll likely buy it with the next Amazon Associates payout. Brand new through Amazon Prime, as of when I write this, it is listed at 9.47 USD with no sales tax (I live in Kansas). Again, brand new. The lowest cost for a “Used – Very Good” copy: 4.49 USD + 3.58 USD for shipping, 9.07 USD total. A savings of 40 cents. Worth it? Depends on a number of factors, such as the seller’s return policy, but in that instance I’d buy the new copy. As mentioned before, it supports the artist. I can get the new copy with 2-day Prime shipping and I know Amazon tends to ship quickly — two things that are unknowns when ordering through the Marketplace. And I know Amazon’s return policy as I’ve had to leverage it before. Which is one of the reasons I love Half Price Books. If a CD or Blu-Ray I buy that looks scratched can’t play (always a risk buying used), they’ll take it back. And I typically have the opportunity to inspect the disc before accepting it. And when it comes to finding CDs that are otherwise difficult to find, places like Half Price Books can work a miracle. Another example. Taylor Swift’s debut album was originally released in 2006 with 11 tracks, including the original version of “Picture to Burn”. A new version of the album was released in 2008 with 15 tracks, including the “radio edit” for “Picture to Burn”. If you were to order her debut album brand new today, the 15 track CD is what you’d receive. If you’re looking for that original version, used is likely your only option. And by some good luck a couple months ago, I managed to find the original release at Half Price Books one afternoon. And for less than what I’d pay for online. Now to summarize, certainly buy used when you can. But depending on the price difference and quality you can find, you may want to lean toward buying new. Not because it’s “better”, but a better value. At the same time, pay attention to return policies when buying used so you don’t get stuck holding a scratched, non-playable disc with little to no recourse, since it’s in return policies that buying new can win out. And if you have a local place similar to Half Price Books, keep an eye out there where you can, especially if they have a guarantee that’ll allow you to return CDs if you discover they don’t work, or, even better, allow you to inspect any discs before accepting them.